Oops! Hi guys! The week got away from me, and here I am already at Friday. Eek! Anyway, this recipe below is actually the first dinner JD made for us post-layoff, and it was wonderful. It was enough for a family of 7, but we had yummy leftovers for days. I was so impressed with how well JD executed this. It required so much chopping and measuring, and for a novice, this can be fairly daunting. But he did a great job, and the result was beautiful! Coat large saute pan with oil. Season chicken with salt and pepper. Brown chicken over medium heat, allow 7 minutes each side or until no longer pink. Sprinkle chicken with cumin, garlic powder and Mexican spices before turning. Remove chicken to a platter, allow to cool. Saute onion and garlic in chicken drippings until tender. Add corn and chiles. Stir well to combine. Add canned tomatoes, saute 1 minute. Pull chicken breasts apart by hand into shredded strips. Add shredded chicken to saute pan, combine with vegetables. Dust the mixture with flour to help set. Microwave tortillas on high for 30 seconds. This softens them and makes them more pliable. Coat the bottom of 2 (13 by 9-inch) pans with a ladle of enchilada sauce. Using a large shallow bowl, dip each tortilla in enchilada sauce to lightly coat. Spoon 1/4 cup chicken mixture in each tortilla. 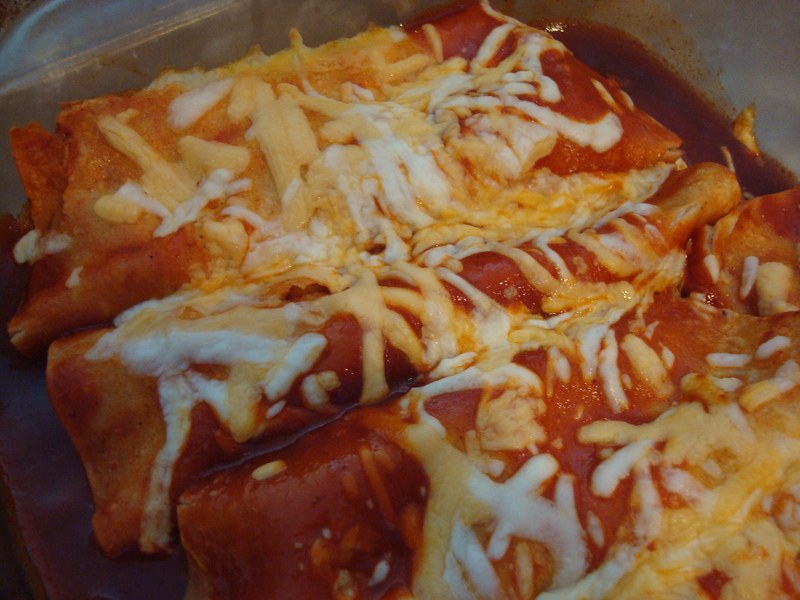 Fold over filling, place 8 enchiladas in each pan with seam-side down. 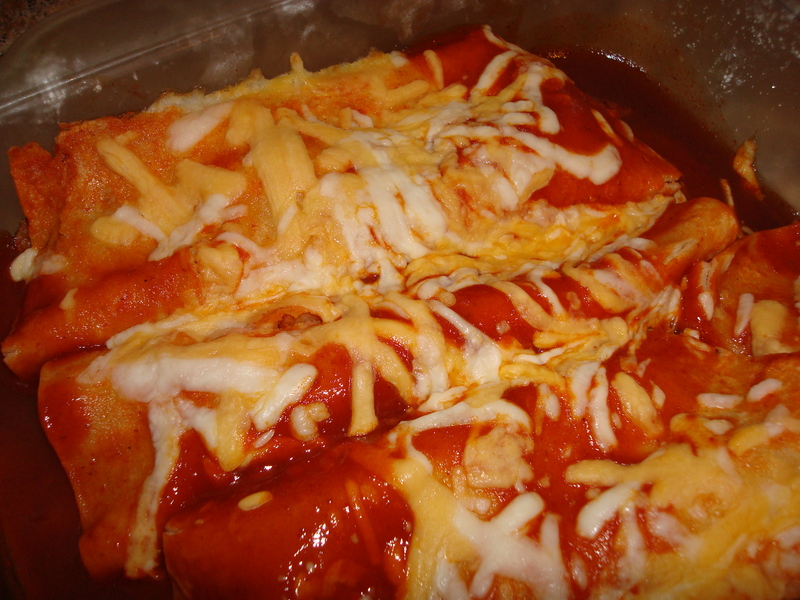 Top with remaining enchilada sauce and cheese. Bake for 15 minutes in a preheated 350 degree oven until cheese melts. Garnish with cilantro, scallion, sour cream and chopped tomatoes before serving. Serve with Spanish rice and beans. ← I love the name Nan, don’t you? Enter your email address to subscribe to this blog and receive notifications of new posts by email (no spam! I promise! ).